Winter is practically upon us and what could be better than donning your winter woollies and pouring yourself a warming cocktail? We’ll tell you what could be better: winning yourself the ultimate “bad sweater” from Canadian Club. In the Northern hemisphere, the annual celebration of ugly winter woollies has become something of a cult obsession – the more cutesy and garish the better. Canadian Club was born in the north, in the Canadian state of Ontario, and traces its roots back to 1858. Once the most smuggled whisky in the US during prohibition, it has endured today thanks to its smooth and easy to drink taste profile. 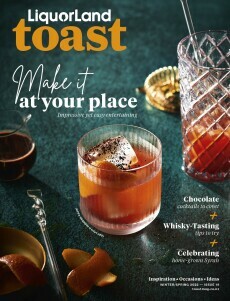 It’s rumoured that Canadian’s like their sweaters ugly and their whiskies tasty, so to celebrate World Whisky Day this Saturday 20th May, Toast is partnering with Canadian Club to offer one lucky reader the chance to win a stunning “C.C. Bad Sweater” featuring a Fair Isle pattern complete with snowflakes and – of course – Canadian moose. The sweater is available in a small, medium or large. To enter, click here, and then pour yourself a Canadian Club whisky cocktail such as the C.C & Dry with a Twist – recipe below.